I woke up in a not-so-good mood this morning that Ijust couldn’t shake of. I mean nothing helped, no positive thoughts and not even my meds. And then I got this weird feeling in my tummy. And that’s when I realize that I hadn’t became a total failure overnight, I was just PMS:ing. Realizing that made me so happy, because that meant my feelings was for real and not made up by the depression part of my brain. 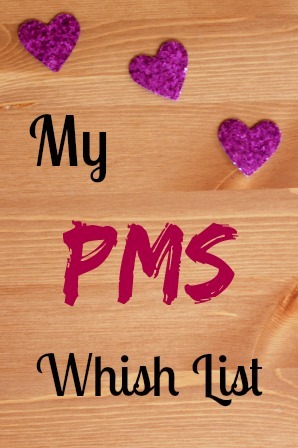 And then I thought that I needed to do this PMS wish list. So I hope you will enjoy it. This is what I want right now. First of all I want chocolate. Or I actually have chocolate because Mr. A is amazing and bought me some on his way home from school. But while we’re at the subject. OMG I love chocolate. I love, love, love chocolate. Chocolate, chocolate, chocolate. Free chocolate for everyone that bleeds okay? First of, stop the makeup-shaming. Yes a lot of us wears makeup, and some of us really love it. We live in a society that tells us from a very young age that once we grow up we will love makeup, and then somewhere in our teens a lot of us will learn that not only are we expected to wear it, but that people will also make fun of us for doing it. I love makeup and I swear that I will never ever let anyone make me feel ashamed over it again. I mean if you don’t like it, don’t wear it. But my face, my rules. 3. No more guys making fun of female behavior. If I see one more “funny” guy on Facebook or whatever making fun of how (mostly) girls and women behave on Instagram/Facebook/blogs/Pinterest I will literally scream. So yeah I have pms, but that is still not funny. So what if we like to drink coffe latte and take photos of our clothes and feel the need to take a #selfie wearing a new lipstick? What’s so funny about it? I’m so tierd of people looking down on the things that are considered female. I’m so tired of female behavior being a punchline. 4. No more ‘the body positivity movement has gone to far’ talk. So this swedish feminist said that we talk to much about our bodies. She even called it a patriarchal trap that made us lose focus from more important things. Of course I don’t agree with her. Empowering people to be proud of their/our bodies is one of the most important things we can do. Internet have given us the power to take back the concept of beauty. I think it’s amazing. 5. No more men trying to explain blogging to me. One of the main reason that I love blogging is because it’s kind of a girls world. It’s made up of so many amazing talented women. So I don’t need men that tell me that my blog never will have readers if I don’t do as they tell me. Or men that brag about how fast thay make money on their blogs. Or men that talk about that their is no money to be made in writing about clothes. You get my point? So dear men of the bloggosphere, we know how to do stuff too. Yes! I loved the last one, you tell them girl! Your blog is great, keep doing what you do. Sitting here alone and feeling fairly depressed, all I can say is thank you. You’re blog has brought a smile to my face, I’ve even laughed out loud at your comments about men. Are we really that bad. And free chocolate for bleeding, c’mon! !!. Congrats on the blogiversary and can this man just say, thank you for writing about you, it’s great. Yes sometimes you really are. Ben that blog about SEO or money and who’s going to act like their way of blogging is the only right way drives me nut for real. And yes I kind of do think that. Because it’s pretty much a bloody hell. No pun intended. I HATE the makeup shaming. As a teen, I got a lot of grief for wearing makeup also… and I look at teenage girls these days and I see that most of them wear makeup too, so this is A NORMAL THING FOR GIRLS TO DO! And I hate it when people tell me, “You don’t NEED makeup,” in a condescending tone, as if my wearing it is offensive to them. People need to mind their own business!